A smart thermostat is a device which you plug to your main home appliances in order to intelligently control your energy usage, and ultimately save money on your bill. How much do they cost, and how much can I save? What are the best smart thermostats on the market? What Cost and What Savings? We know what you're really interested in learning from this page! How much can a smart thermostat benefit you, and which one you should buy! So let's hop straight to it. The average annual energy bill in the United States comes to slightly more than $1200 a year--a large percentage of that due to heater and air conditioner use. Clearly there are big savings to be realized if smart thermostats function effectively. So are they cost-effective? How much do smar thermostats cost, and how much could you save? What are the best smart thermostats? Nest Learning Thermostat ($249) - The Nest brought great design to thermostat-land, with a clean and retro dial-based interface. A learning algorithm helps the Nest adjust to your daily routine, so that you don't have to spend time setting home and away modes. It sends you energy reports about your usage, helping you moderate your consumption. Honeywell Lyric Thermostat ($249) - You can set the Lyric to activate when you come within or go beyond either 500 ft. or 7 miles of it, thereby activating its home and away modes. Hive ($249) - British firm Hive claim that their smart thermostat will pay for itself in 15 months, saving consumers roughly $200 per year. It does this by connecting to your smartphone via a moobile app and allowing you to control when your heating is on and off, and at what setting, while away from home. Tado ($279) - Like the Lyric, Tado uses geofencing in addition to using local weather conditions and learning about your home's physical characteristics to save up to 30% on your energy bill every year. It does this not just by adjusting its heating to your habits, but by adjusting how it heats or cools your home based on local weather conditions and your home's characteristics. Honeywell Smart Thermostat ($250) - Honeywell has a line of smart thermostats with similar functionality as the others, some of which enable zone control as well. That is, setting different heating and cooling parameters for different rooms of your house. Read on for some more information on different types of thermostats and the different features they offer. Traditional Honeywell thermostat only has a hot, cold and off mode. A thermostat is a simple tool to regulate the temperature of your home. It enables you to control your home's temperature throughout the day. Different thermostats have different features, which will enable you more or less to control your home energy usage. The first thermostats were simply made of an On and Off button, and a temperature dial. Other more advanced thermostats also contained a clock which could let you define at what time you wanted your heating on/off. Today, thermostats have become far more advanced, with a host of features. Programmable thermostats allow you to create complex schedules of whatd days and times you want your heat to come on, and at what temperature. Other thermostats, the "smart thermostats," have integrated their features into smartphone applications, and even learning from your daily habits and predicting when their usage is needed. When you purchase an electric appliance, the power consumption will usually be written on it (either on the box, or on a sticker on the appliance itself). This will indicate what power it is consuming when in use. It will not indicate the average power consumption over time but rather the power consumption at full power. For example, a microwave oven will consume a lot of energy when turned on, but none when turned off. And even though it consumes a lot of power when functioning, you might only use it a few minutes a day. In the following table we show the power consumption (in watts), and the energy in consumes every day on average (based on the typical amount of time each appliance is turned on every day). Smart thermostats are normally connected to your home's wireless connection, which helps them store and retrieve data. At the most basic level, smart thermostats allow residents to control the temperature of their home on a schedule. This helps to save on energy costs and pollution since it helps homeowners reduce usage when it is unnecessary. At the most advanced level, thermostats like the Nest or Hive connect to the internet to give you advanced control over your home while you are away, and learn from your habits. The Ecobee even includes motion sensors to automatically tell when you are away, and promises to factor local weather conditions into its algorithm to heat and cool your home most effectively and efficiently. They work for both electricity and natural gas. By adjusting the temperature a few times, the smart thermostat can learn when you are home. Some thermostats, called learning thermostats, can learn when residents will be home - and prepare the heating or cooling for them. In zoned systems, smart thermostats can warm or cool only rooms which are in use. Users can program the thermostat to warm only their home office for example, if they work from home, or to only heat their bedrooms at night, but not the rest of the house. Tests of zonal systems like the Honeywell EvoHome have found energy savings of nearly 25% compared with traditional thermostats. Most smart thermostats are easy to install, and nearly all come with offers for professional, paid-installation. Many smart thermostats will let you know when you are using an environmentally friendly temperature. For instance, with the Nest thermostat, this is signified with a green leaf that appears on your thermostat screen. On days when you consume less, or choose energy efficient temperatures, you can earn a green leaf, for example. Usage reports are generated to help you understand where you might be able to economise on energy use. Monthly reports, or even real time data, are common for smart thermostats. These reports compare your monthly energy usage and include tops on how to conserve. The Nest thermostat claims that it can save you up to 20% on your electricity and gas bills. With auto-away, your Nest smart thermostat knows when you leave your home and automatically turns down the temperature. When humidity is lower, your AC control can automatically lower your AC, or change it to fan-only when cooling is no longer necessary. Smart thermostats utomatically know when you leave and lowers the heat. They turn the heat on when you are coming home, or when it predicts your arrival (for learning systems). Some smart thermostat makers are giving utility companies access to your thermostat--with your permission, of course. For example, Honeywell, 120 stalwart thermostat manufacturer, is including the ability for "demand response" in its wifi connected thermostats. That means that if you give permission, utilities will be able to adjust the settings of your heat or air conditioning during times of the day when electricity or natural gas demand (and therefore prices) is high. Similar initiatives have been or are in the process of being implemented by Nest and other competitors. 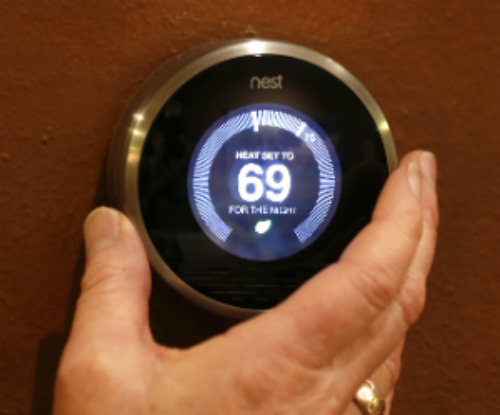 This has raised privacy and data concerns among individuals that many smart thermostat makers are workign to address. For example, Nest follows a strict policy of only partnering with energy providers who abide by its ironclad guarantees of no data sharing or selling, and protecting consumer privacy. Users who have opted in are notified beforehand of specific demand-response events, and can opt-out of them on an individual basis should they choose. Demand response has important implications for renewable energy production, because it can help to smooth out demand for the sometimes intermittent supply of wind and solar energy. Smart thermostats work to reduce energy usage, and thus fossil fuel consumption. Beyond transportation, buildings are the biggest consumers of energy, and so efficiency gains in home and commercial energy use are extremely important. Additionally, the application of demand response can help make alternative, green energies more viable for the electric grid. Thermostats today...what follows tomorrow? The integration of multiple parts of the home with electrical grids, the internet, your smartphone, and with each other is collectively referred to as a "smart home." As the internet of things continues to progress, it is absolutely conceivable that sometime in the near future the way our homes function will be entirely revolutionized. We can imagine smart thermostats giving way to completely integrated home electronics that act independently and automatically to heat water, charge electric cars, open and close blinds for passive solar heating or cooling, and heat and cool your home to save energy. The smart home of the future will also be an actor in the electricity grid, with power production decentralized and stored in home batteries like the Powerwall, to be charged and drawn from as needed, and according to the supply and demand levels on the grid. Beyond residential homes, businesses will be able to benefit from smart systems that manage and control their energy usage, in a search to find more and more ways to conserve and save.